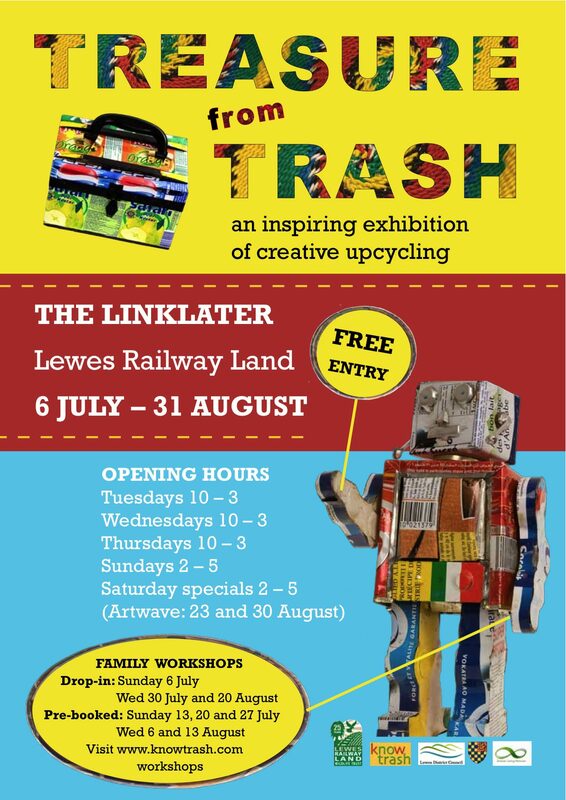 Treasure from Trash, a colourful and captivating free exhibition of creative upcycling from around the world, is showing at the Linklater, Lewes Railway Land in Lewes, until August 31. It will intrigue anyone who has ever thrown anything away, since every object in the show used to be something else! Open Tuesdays, Wednesday and Thursdays 10 – 3pm and Sundays 2 – 5 pm. The exhibition celebrates the ingenuity of skilled makers around the world, who transform trash into useful artefacts and works of art. Visitors will be amazed at what can be made from things that are thrown away – jewellery from old flip-flops, handbags from sweet papers, toy vehicles and animals from metal drinks cans and even a 3D chicken from plastic bags. Both practical and decorative, these innovative upcycled objects will help you to rethink, if not treasure, your own trash. Also on display are two dozen chairs imaginatively upcycled by locals and the winning entries of an upcycling competition, which challenged entrants to transform a plastic milk carton into a new and unexpected treasure. 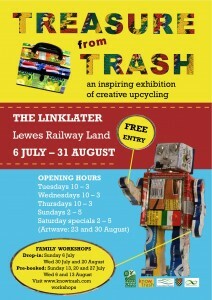 Treasure from Trash is curated by knowtrash, the Lewes-based partnership of Ruth Thomson, children’s author, and Neil Thomson, film editor and photographer. They have sourced their unique collection of more than 4,000 artefacts by makers and markets from more than 35 countries around the world. The exhibition originated in partnership with the Eden Project in Cornwall and has been touring the UK ever since. The exhibition is accompanied by a series of hands-on upcycling workshops for families. 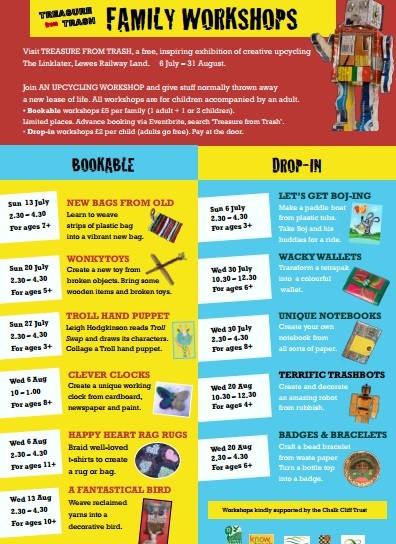 Bookable workshops are £5 per family (1 adult + 1 or 2 children). Book via Eventbrite (search Treasure from Trash). Just turn up for the drop-in workshops. Wed 30 July: Wacky Wallets. Transform a tetrapak into an eye-catching wallet. 10.30 – 12.30. Age 6+ Drop-in. £2 per child, adults go free. Wed 30 July: Unique Notebooks. Create a unique notebook from scrap papers. 2.30 – 4.30. Age 8+ Drop-in. £2 per child, adults go free.